Super Savings Item! 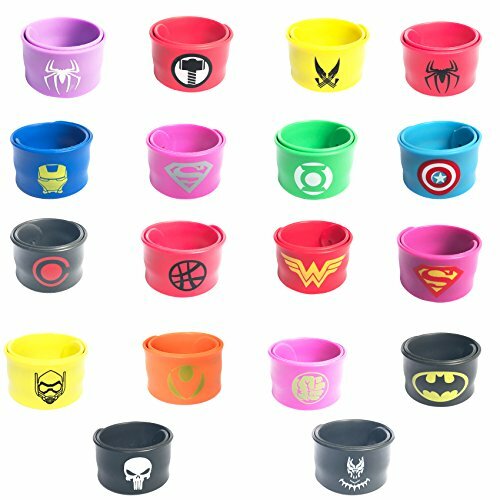 Save 39% on the Yuuzz Superhero Slap Bracelet for Kids Boys & Girls Birthday Party Supplies Favors (18 pack) by Yuuzz at Saltarines Quito. MPN: Silica gel Wristband. Hurry! Limited time offer. Offer valid only while supplies last. 18Pack Superhero Slap Bracelets Children love their superheroes and nothing excites a kid more than pretending to fly through the air like Superman. Now you may enhance your child's imagination with our set of 18 different Superhero Costumes Slap Bracelets : featuring all of your kid's favorites! Presents and Perfect Party Favors for Kids, you will be fashionable with them on. Great for birthday goodie bags, incentives for students, ornaments for party. Share and exchange with your friends now. MONDAY THROUGH FRIDAY SELECTION - With 10 different options to choose from, your little boy can go to school as a different superhero everyday of the week! FITS MOST CHILDREN 3-8 COMFORTABLY-GROWN UP PARTIES... yes, we admit these are kids' items. But many fun seeking adults wear them as funny little items out to the bar or friend's birthdays. You're never too old for fun, right?. We guarantee that you will be happy with your purchase of Yuuzz 18 pack of Superhero Slap Bracelet. If for any reason you are not satisfied with your order, simply send it back for a 100% refund! No questions asked! Simply click ADD TO CART NOW and enlighten your kid's childhood with an outfit they will remember! EVERY KID WANTS TO BE A SUPERHERO - Now it is possible! This set is perfect for children over 3 that want to pretend to be their favorite superheros during the day. Good choice for your kids Superhero party,birthday party, Christmas, Halloween,dress-up theme party and more. 100% HIGH QUALITY, FOOD-GRADE SILICONE RUBBER. Hypoallergenic, free of BPA, latex, phthalates; non-toxic. Strong, durable; safe for kids and adults. Dishwasher safe, easy to wipe down or clean, bracelets retain their vibrant colours. If you have any questions about this product by Yuuzz, contact us by completing and submitting the form below. If you are looking for a specif part number, please include it with your message.